With ChurchSuite you are always in control of who has access to your ChurchSuite account, creating users and assigning their permissions. In the interests of transparency, and in best compliance with the EU General Data Protection Regulation (GDPR), the ChurchSuite support team no longer have access to your account or the data within it, unless you choose to enable support access. Support access is disabled on your account by default. You may enable (or disable) support access at any time - it's like an on/off switch (see below for further information). Support access can only be enabled/disabled by Administrator users. 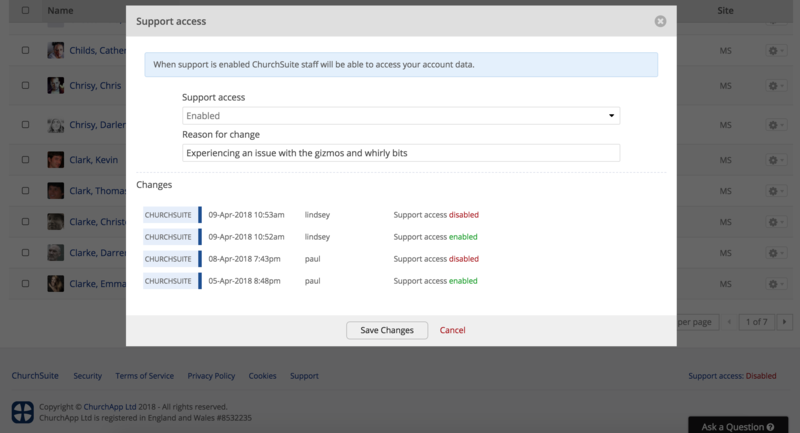 When enabled, support access only permits the ChurchSuite support team secure, logged access - perhaps in response to a support request or if an issue or bug is detected by our monitoring systems. Support access does not affect the security of your account or the data within it, and no data is accessible by other parties - support access is just for the ChurchSuite support team. Where ChurchSuite support access is disabled, we may only be able to provide generic support responses and support article links to you, your users and those in your Address Book who may contact us requesting assistance with an issue. Without support access we may need to redirect support requests back to you in the first instance. Enabling support access is not a requirement for the service, but enabling access to our support team will help us to deliver the highest levels of customer service in a timely manner. The support access status is visible in the bottom right hand corner of every page in ChurchSuite - in this example, support access is disabled. When an Administrator clicks that "Support access" link, a pop-up window opens. From here, support access can be enabled and an optional reason added. Once enabled, support access will remain enabled until such time as access is disabled by an Administrator. Note also that a Changes log is maintained, detailing the date, time, user and reason for each support access status change. An email notification is also sent to the Data Protection contact set in your Administrator > Profile, and a log of that email is recorded in the Communication log at the bottom of the Administrator > Profile page.